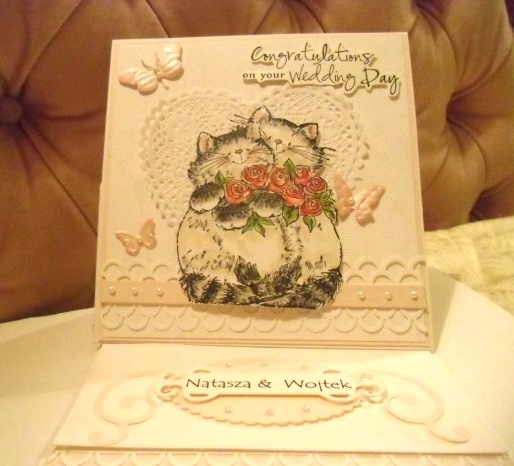 Beautiful wedding card Sylvie and different!! This cards are look so fabulous.It look so stylist and cool.Thanx to share with us nice collections of cards. Fab and beautiful card Sylvie - you did really well with such an unusual request! How lucky are you Sylvie crafting in the sunshine. This card is so pretty, the image is so nice. I'm sure it will be treasured forever. Wow Sylvie this is beautiful what a fabulous image and I do love the design of this so much. The cats are great! What a surprise for me to see polish names on it ;-) For sure they will love it!